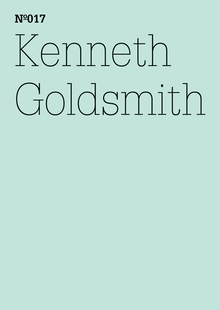 New York-based poet Kenneth Goldsmith’s contribution to the Documenta Notebooks series is a letter to Bettina Funcke, the series’ Head of Publications. In the following excerpt from this letter, Goldsmith describes his work with “Uncreative Writing,” his curating of Ubuweb and the new skill sets needed for writing in the digital age. I teach Uncreative Writing in an English department at an Ivy League University: I teach students to appropriate, plagiarize, patch-write, and steal. If they show a trace of “creativity,” they are demoted. For a final project, I make them break the most sacred taboo in academia: they must buy a term paper from an online paper mill and present it to me as their own. What I do in the classroom is illegal and unlawful; some might even call it immoral. But the students—and even the parents of the students who have sat in on classes—love it. Finally, what they’ve surreptitiously been doing for years is brought out into the light of day and framed in terms of responsibility rather than reckless “theft.” At the end of the day, I don’t expect them to forever write this way. Instead, they’ve got another tool in their writing toolbox. Unlike the reaction to Day or UbuWeb, students understand that such gestures have many dimensions, that by writing this way, they can also continue to write in more conventional ways. It’s not either/or. But this is typical of their generation: the Internet is just another tool, like oil paint and ceramics. I admire their fluidity and their nonhierarchical approach to media. Look. I know that UbuWeb is not very good. In terms of films, the selection is random and the quality is often poor. The accompanying text can be shoddy, mostly poached from whatever is available around the Net. So are the films: they are mostly grabbed from private, closed file-sharing communities and made available to the public, hence the often lousy quality. It could be done much better. Yet, in terms of how we’ve gone about building the archive, if we had to ask for permission, we wouldn’t exist. Because we have no money, we don’t ask permission. Asking permission always involves paperwork and negotiations, lawyers, and bank accounts. Yuck. But by doing things the wrong way, we’ve been able to pretty much overnight build an archive that’s accessible to the public free of charge. In 1969, the Conceptual artist Douglas Huebler wrote, “The world is full of objects, more or less interesting: I do not wish to add any more.” I’ve come to embrace Huebler’s ideas, thought it might be retooled as, “The world is full of texts, more or less interesting; I do not wish to add any more.” It seems an appropriate response to a new condition in writing today: faced with an unprecedented amount of available text, the problem is not needing to write more of it; instead, we must learn to negotiate the vast quantity that exists. I’ve transformed myself from a writer into an information manager, adept at the skills of replicating, organizing, mirroring, archiving, hoarding, storing, reprinting, bootlegging, plundering, and transferring. I’ve needed to acquire a whole new skill set: I’ve become a master typist, an exacting cut-and-paster, and an OCR demon. There’s nothing I love more than transcription; I find few things more satisfying than collation. Pbk, 4 x 5.75 in. / 32 pgs / 1 color.